It was hard to find some sleep yesterday after all this coffee, whisky, yummy food and excess sugar in the biscuits. 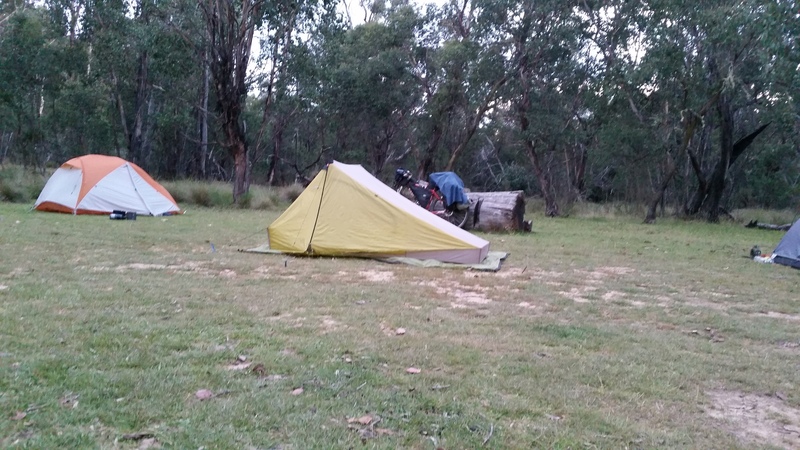 But after closing the sleeping bag until there is only a small hole for me to breathe, I get warm and cosy. 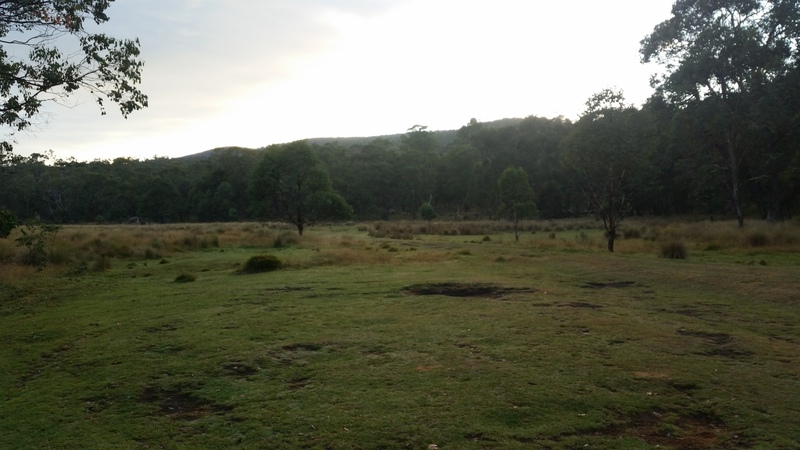 Sometimes in the night brumbies come near the tent, I hear them coming, “talking”, leaving in a gallop and coming back again. What a lovely animal. My dreams are about dingoes and wild dogs though. I learnt yesterday thanks to Derek and Simon that dingoes are endemic to Australia and are generally shy, but, wild dog’s ancestors were pets that got back into the wild. Wild dogs are the ones making the wolf calls and my new friend confirmed to me that they do their calls when they have located a target and are spreading the word. The other night, I was possibly in trouble with those wild dog and I got lucky. That is why it’s important to arrive early at the campsite so that I have time to light a fire. This morning I was looking forward to breakfast. I got offered warm tea, bacon and baked beans , toast, cheese and tomatoes. They make jaffles out of them. Now that is royal camping! I started to pack up late. Simon comes to me and offered me 3 huge chicken patties for lunch. I was stoked. I exchange email addresses with Derek and Simon and I’m off the trail. What a beautiful campsite and lovely people. I did enjoy every bit of the conversations. They still think I’m mad doing that on a bike though. I’m riding on the trail and notice that the front tire is pretty low in pressure. It has been the case for a couple of days and was meaning to fix it. The downhill becomes hazardous and I promise to myself to fix it right at the bottom.Too late, the tire (which does not have tube) is critically low and there is not enough pressure anymore, it becomes completely flat. I put a tune in the wheel, pump up and I’m back on the trail. I start to think that I’m running out of disk brake pads and spare tubes. Not sure if I should risk it or ask a friend to send those items by mail. A few steep uphills, followed by steep downhills, I’m pushing the bike and it’s hard work. This time I put some music on and find myself enjoying it. I don’t think the trail will defeat me today. The Brumbies are chatting in the background which make this even more enjoyable. To my surprise I make it to the campsite at 2pm. I had told myself it would be reasonable to have a short ride and get a lot of rest in the afternoon. The river crossing have been easy as usual and I’m here very early. 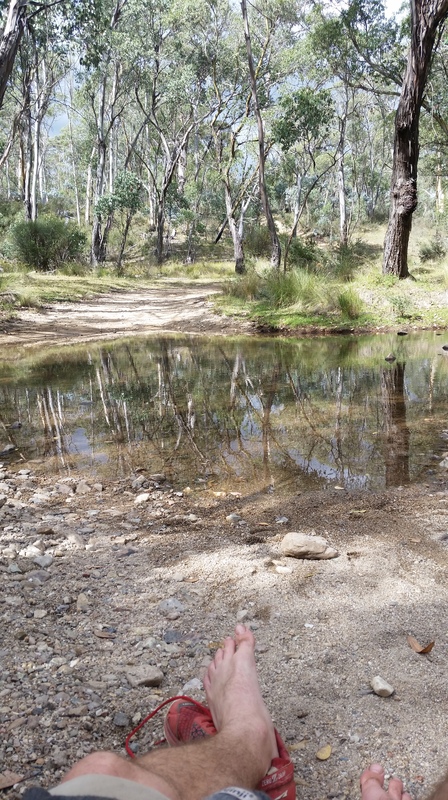 I check the route notes and discover there is plenty of water available along the trail until the next campsite, so I decide to keep going and push for another 13kms uphill. I remember that I have those patties and have a big lunch. That does the job. 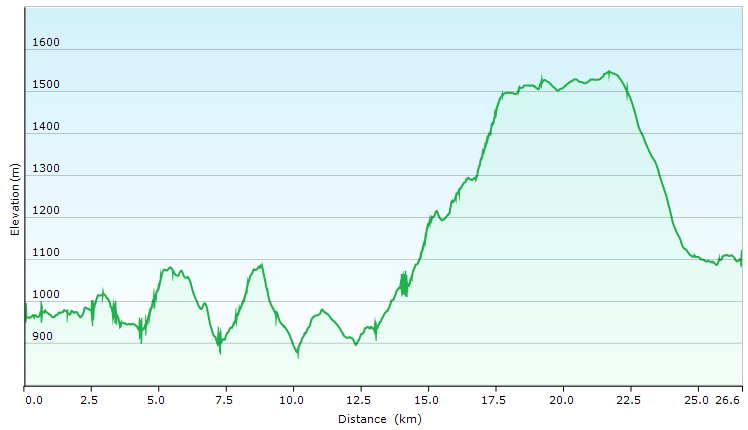 And after that I’m climbing the 500m elevation so fast I can barely believe it. It’s steep but I can keep a momentum pushing the bike. Finally at the top, the scenery is amazing and I join the hut which is next to the Alpine trail. 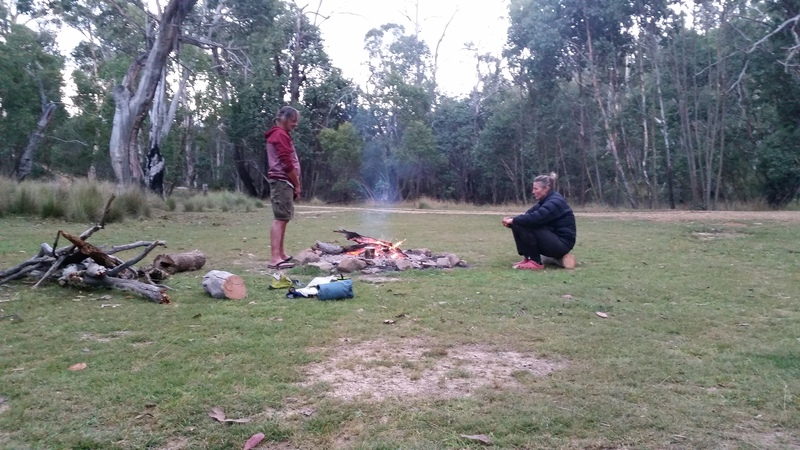 Once I reach the campsite, two trekkers are there with a fire running. One of these people is hiking the whole Alpine trail, I actually met her brother a few weeks ago when he had come to provide her food on the trail. The evening is pleasant and spent chatting about trekking, food and gear weight. I can’t believe how things have changed in the last two days. Getting in and out of Bindi station was not really pleasant, but now I’m enjoying the ride and found myself happy on the trail, singing and dancing on my bike to celebrate yet another Hill climbed without difficulties. It’s still too steep to ride my bike but it’s much easier despite the heavy weight of the pack. Checking my route notes, I noticed I once again got a day back on the initial plan. I left Omeo 4 days ago. I might make it to Khancoban in 7 or 8 days instead of the 11 originally planned. My worries about food are gone and I’m once again in excess of meals. My appetite has been crazy recently. I can eat a meal every hour. This is a good news, it means I’m healthy and adapting to the daily work. I’m just unbalanced with probably too much dinner food and just enough snacks and lunches. I’ll work that out once in Khancoban after I get hold of my next food parcel. On a side note there is still this Farmer invitation pending. I’m curious about it. He promised a warm dinner and shelter. My friend last night made jokes and said he is trying to marry me to their daughter. This could be an interesting dinner. I can feel Canberra getting closer, and with it the 1,000 mark and the end of the Victorian mountains. I’m so excited that the worse is behind me and things are becoming more enjoyable and a lot less stressful. Although they are announcing snow and I’m somewhat excited about the challenge it could cause.